No, they aren't holding the World Castanet Championships in my lounge room, that's just my teeth chattering!! Brrrrrr!! Toowoomba is experiencing what the weather man calls a "Cold Snap". I think that means it's going to get so cold that your fingers might snap off if you go outside!!! I should probably warn you all now, I HATE, HATE, HATE, really seriously dislike!!! Cold weather!!! SIGH! It could be a loooooooog winter! Must tell Linda from Lilly Cottage that the cold weather I warned her about when she visited several weeks ago has shown up with friends now!!! 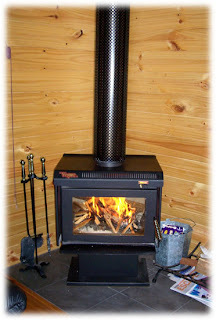 In fact, it's been so cold the last two nights that I even told my beloved, also-cold-hating, Geek Boy that he could drag the ugly-but-effective gas heater out of storage about a month before I thought we should need it. As I type this, it is currently 9 degrees in the Garden City of Toowoomba and predicted to drop to 6 degrees. Now, I hear all of you overseas types sneering at me and calling me a wimp cos it doesn't even SNOW here, but let me just say in my defence, there's a REASON I've not chosen to live somewhere where it snows!!! Hmmm, it ended up a little larger than I originally envisaged - why does that always seem to happen to me!!! Ah well, just means it'll be plenty big enough for two to snuggle under, doesn't it! So now I just have to work out how I'm going to quilt it... Still thinking!! 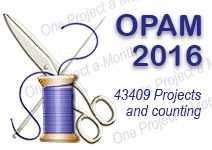 Apart from a little hand stitching on a couple of new stitchery patterns I'm working on, that's about all I've been up to in the last day or so - apart from the odd chat over a cuppa of course! Tee! Hee! Hee! So, I shall sign off for now and be back after my craft show expedition, no doubt with lots of goodies to show and stories to tell!! If you're going to be in Bris for the craft show on Thursday, maybe I'll see you there - you'll be able to recognise me as I'll be the one rubbing my hands together in glee and muttering, "So many fabrics, so many beads, so many pretties - so little play money!!" Tee! Hee! Hee! Til next time, Bear Hugs! Yes, I'm a VERY baaaaaad girl!! I have a very loooooong list of "things to do" and what did I do today?? I started another quilt!! Oops! I don't know why I keep doing this to myself and really all I can say in my defence is, "It's not for me!!" We had friends come round for desert and coffee last night, which was great fun - deserts are the funnest cooking projects, aren't they!! (I made one of my specialities - apple and ginger pudding with custard - YUMMMMM!!!) 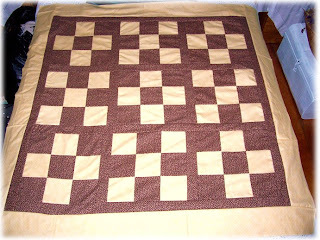 Now, it's been getting a little cooler at night here in Toowoomba, so I've dragged out my flannel quilt that I made a couple of years ago (the one I've actually FINISHED!!) 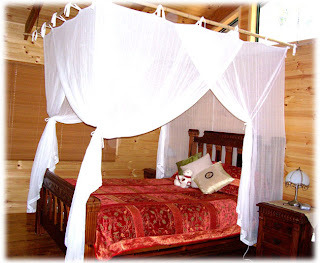 And I noticed our friends both tucking cold tootsies under the quilt last night, as well as brushing the soft fabric. So ... I thought I'd like to make them one for their own lounge chair. As they're moving in the next month, I thought it would be a great housewarming gift and, me being me, couldn't wait to get started. I don't know about you fellow bloggers, but once I've had an idea for a new project I want to drop whatever I'm working on and start the new one right NOW!!! Tee! Hee! Hee! 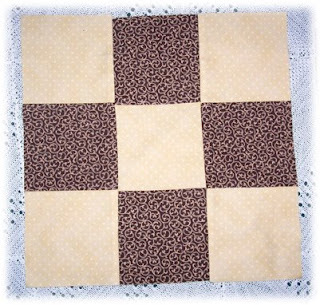 So far, I have some big nine-patch blocks done, with intentions of putting dark sashing between all the blocks. Here's a closer look at the patterns on the fabrics. They're lovely warm golden/brown tones that remind me of chocolate mousse - or is that a rumbling tummy looking for a midnight snack! Tee! Hee! Hee! 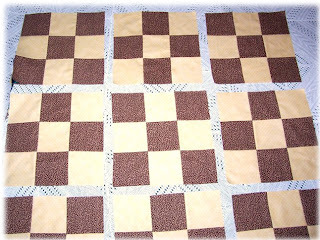 Perhaps I'll call it my Chocolate Mousse Quilt! 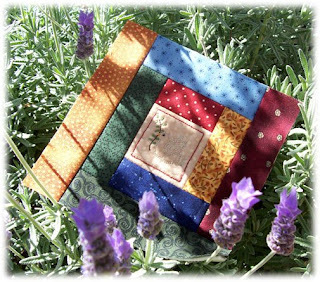 There's nothing much better than curling up under a hand made quilt on a cold winter's night with a good book and a hot chocolate - it's one of the few things I DO like about winter!! The only downside to my flannel finding expedition today was that I'll have a little less play money to spend on Thursday when I head for Brisbane for the Stitches and Craft Show!!! YAY!! My best buddy, Lynette, and I are planning a play date and I'm really looking forward to it - so much to see, so many wonderful crafts and so many clever people to chat to! I'll be sure to take my camera when I go so I can report back!! Now, however, I have a sudden craving for hot chocolate and a good book! Tee! Hee! Hee! Hope you're cosily cuddled up tonight! Til next time, Bear Hugs! Today I am thankful for ... Family! Now, there are probably some days when I don't feel QUITE so thankful for my family, but that's what family's all about!!! So, what has made me focus on family today? A couple of things. The first, was the chance I had last night to catch up with my little bro. He is three years younger than me and was christened Paul James Menzies Kippen (being the boy of the family, he copped all the 'family' names! Tee! Hee! Hee! ), but as often as not, I call him 'Stretch'. Now there would be some who would think this is because he's been taller than me since he was about 13, but they'd be wrong! I in fact gave him this nick-name after the rubber chicken that Garfield often uses to fool/clobber/harass Oddie with in the "Garfield" comics, because when he was growing up, Paul was all gangly arms and legs, so I thought he looked like ... a rubber chicken! Tee! Hee! Hee! I think it was partly an older sister tormenting a younger brother, but also part frustration that he took after the tall, thin side of the family, while I took after the short podgy one! SIGH!! However, despite the usual sibling bickering as kids, we have always been great mates, though we don't get to see each other often these days. You see, he lives in Alice Springs! No, we didn't take a quick flight to our continent's centre to see him, he was in Brisbane for a work training course, so we ducked down for dinner and late night shopping to catch up. But first thing on the agenda was ... a big bear hug! As you can see, there isn't a great deal of family resemblance - until you put our father between us!!! Each of us look like Dad in certain facial features, so he's the link between us. We had a great time roaming Garden City shopping centre, checking out books, movies and music - three passions we share! We then found a coffee shop to sit and chat, before adjourning to his motel to chat some more ... in fact, it was about 11pm before we left Brisbane to drive the hour and a half home - but worth it! Paul and I chat regularly on the phone, but in-person catch ups are always so much nicer! So ... that was the first thing to make me think of family. 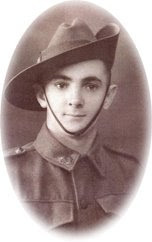 The second is, today is Anzac Day. For my overseas visitors, it's a memorial day commemorating Australian and New Zealand troops landing at the beach of Galipolli in World War I, but it also recognises the contributions of servicemen and women from that time to today. So, that makes me think of my Mum's father, my Gramps. Here's a photo of him in his uniform. Isn't he handsome - and so young!! Gramps was posted to New Guinea where he helped build airfields. For many years, he wouldn't talk about his time in the army much, it was only in later years that he started to tell a few stories. One that he told was when they were given the task of extending a runway of an airfield and the only way this could be done was to re-claim some swamp area. He said they were in the middle of pushing a load of dirt to dump into the boggy area to build it up, when the air raid siren went. Well, he said men were running everywhere, bolting for the nearest shelter - including the driver of the bulldozer who jumped out of the machine and left it zig-zagging drunkenly along the runway! Apparently it took them a couple of days to get it out of the swamp after it had run off the end!! At the time, however, Gramps found himself running next to the dozer driver, a six foot plus, Afro-American serviceman who, as he was running, called out loud, "Lord! If you keep pickin' up mah feet, I sure 'nuff'll keep puttin' 'em down!" I always get a funny mental picture from this story!! Unfortunately, Gramps passed away suddenly before I had a chance to hear all of his stories and I still miss him. Being a returned serviceman, the 'Last Post' was sounded at his funeral and so today, and any other time I hear that bugle, I think of my Gramps. So ... today, I am thankful for ... FAMILY! The good, the bad, the ugly, the funny, the heartwarming, the heartbreaking, the unspoken but unreserved support and love that 'Family' is to me. Whatever you're doing today, I hope you get to share it with at least some of your family. Til next time, Bear Hugs! You've heard the saying, "It's raining cats and dogs", well in our household tonight, it just seemed to be raining ... dogs!! 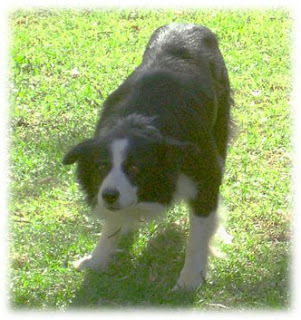 I'll start by explaining that, before Lilly came to live with us, our Border Collie, Wombat, was happy to be an outdoor dog. Occasionally, when he'd had a bath and didn't smell like something that had been dead a week!! he was allowed in for a tummy scratch, but was always happy to head for the door after about 10 minutes - or if we stopped scratching his tummy! However, when Lilly joined our family and began to spend evenings on a rug on the lounge room floor, Wombat decided if it was good enough for "her" it was good enough for him ... and so a second rug was added to the lounge room floor. It was pretty much a dead-heat to see who climbed onto Scott's lap the quickest! 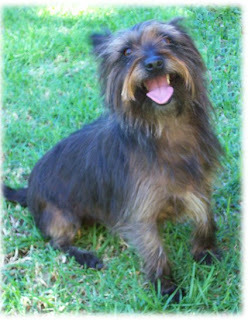 There goes Wombat's macho image - wait til all the other dogs in the neighbourhood see this photo!! Tee! Hee! Hee! The funniest part probably wasn't that Wombat ended up on Scott's lap along with the more-expected-fraidy-cat Lilly, no, it was the look of complete disgust on Lilly's face at having to share Scott's lap!! Oh dear! Who needs kids?!?! 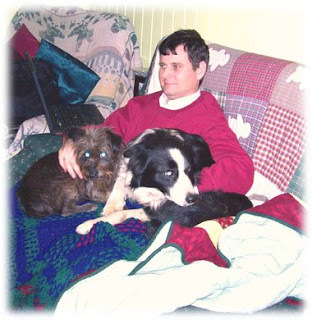 Needless to say, even the inimitable Geek Boy couldn't manage to balance two dogs (one not REALLY meant to be a lap dog!) AND the notebook computer, so he was none too impressed either! And as for me?? My biggest concern was not falling off the couch laughing at all three of them and the VERY comic picture they made!!! Tee! Hee! Hee! So, that was a rather exciting ending to a productive day. Not only did I complete the instructions for Berry Basket Bonnie that I've been procrastinating about for some time, I ALSO finished the Card Kit layout and instructions for the "All Things Grow With Love" wall hanging! Yay me!! Both are now ready to print, which will probably be a job added to this weekend's job list. I also re-took photos of both projects, as I hadn't been very happy with the originals. These are the new ones - what do you think? This is Bonnie, all set up for her tea party with friends Katie and Tilly. I'm sure if anyone had arrived while I was setting up for the photo they'd have thought I had more than a few screws loose! 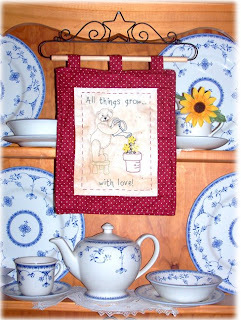 To get her to look her best for the photo, Bonnie had to be hanging on the wall, but I really wanted the tea party makings near her, so ... the only way I could do that was to raise a flat surface to her level! Imagine, if you will, a folk art decorated cream can with a plastic wheelie box balanced on it, which in turn, has two different size boxes balanced on top, with a tablecloth and doily spread over it and the tea things set up just so!!! Probably worth a photo in itself! Hmmm, perhaps I'll do that next time!! 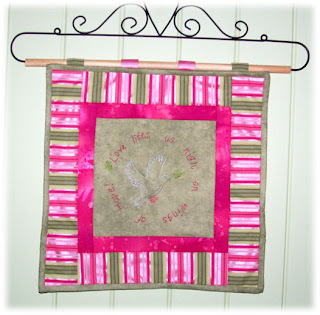 And then, there's the new photo of the Card Kit wall hanging. I like how vivid the red looks against the blue and white dinner set - a birthday gift from my beloved Geek Boy a few years ago! So ... with two lots of pattern instructions crossed off my "To Do" list, I think that means I'm allowed back into the sewing room to play tomorrow! YAY!! Ooooohhhh!! What mischief can I find in there?!! All that fabric ... all those wonderful colours ... all the pretty ribbons and laces ... all the possibilities!!! OOPS! Creativity rush!!! Tee! Hee! Hee! Will keep you posted on the outcomes of my creative play! Now, however, I think all of that thinking has drained my batteries and it's time to visit my pillow. Til next time, Bear Hugs! This will be a world-record-setting short (for me!!!) post today, as I don't actually have much to chat about today, but I really wanted to share a photo with you all! I don't think there's much else in the world that will cheer you up as quickly as a child's smile! I know that seeing the joy and mischievous fun on Gracie's face made me smile! I think sometimes in life, we're 'trained' to be 'serious' and 'grown up' so that we often miss the joy in the simple things - a pretty butterfly, a sweet-smelling flower, silly antics from our pets - or the innocent smile of a child! Whatever you're doing today, I hope you take time to indulge in the joy there is to be found in life's simple things! Til next time, Bear Hugs! I've found a cure for writer's block - a good dose of retail therapy! Tee! Hee! Hee! For some time now, I've been trying to motivate myself to write instructions for a couple of new patterns, but every time I sit down to write ... nothing!! So, today I decided to walk away from it for a while, grabbed Deb, one of my dancing buddies, and off we went to the shops!! We hit one of the local shopping centres that I often avoid because the car park is invariably like a demolition derby, but there were several shops I needed to visit for specific items that I couldn't get anywhere else. Deb was a noble and loyal friend and came with me and we had a lovely time! As much as I love him, my beloved Geek Boy (like most of the male population!!) absolutely LOATHES shopping! In fact, he would happily never set foot in another shopping centre and instead, order everything on line!!! SIGH! So, shopping with a female friend is much more conducive to a fun excursion!! 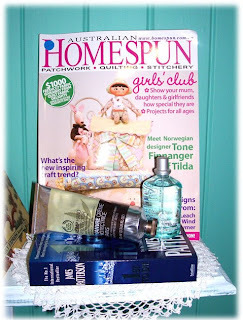 I got the latest "Homespun" magazine (my fave craft mag and the Managing Editor was in the same uni class as me! ), used a gift voucher I received for my birthday to buy a James Patterson novel (love the TV show, checking out the books!) and my hand cream and perfume from The Body Shop. I'm REALLY fussy about hand cream, as a lot of crafters are, because there's nothing worse than the needle shooting out of your hand because your hand cream is too greasy or having your fingers catch on fabric because the hand cream doesn't moisturise! And since my fave perfume was discontinued (Monsoon) the only replacement I've found that comes close to the same scent is "Oceanus", a Body Shop standard. I loooooove old ports!! Here's a closer photo of the beaded tie. The combination of feathers and beads was just too much to resist!! Tee! Hee! Hee! Bonnie and the Bears (sounds like a pop band!!) are currently sitting on my mostly-tidy computer desk to remind me of where I'm up to! So ... there you go!! Next time you're procrastinating or struggling to write something, the cure is very simple - grab a friend and hit the shops! Of course, husbands everywhere are now going to hunt me down and beat me over the head with their credit cards, no doubt!! Not that most of us really need TOO much encouragement to indulge in some retail therapy! Tee! Hee! Hee! Anyways, it's time I saved my instruction files and organised something for dinner. Hope you enjoy a spot of retail therapy to relax this weekend - or like me, enjoy the fruits of such an excursion! Til next time, Bear Hugs! Oh No! Oh Dear! What a dreadful, forgetful person I am!! In all my excitement to share my weekend of fun with Linda from Lilly Cottage, I forgot one of the most important things! The lovely Linda spoiled me with a wonderful late 'bear-thday' surprise! 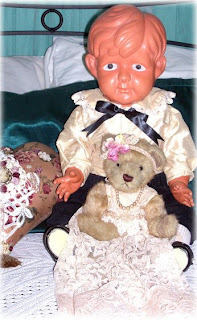 Linda brought me a new member for my Tag Along Teddies Bear Hug - her name is Pearl and isn't she a sweet, genteel looking little bear!! 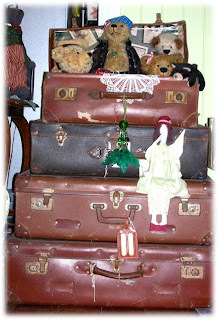 She has already found a comfy spot to curl up in the spare room with Jimmy, the celluloid doll that belonged to my grandmother, then my mother. And if she gets a little sleepy, she can rest her furry head on the heart cushion beside her. Pearl is just GORGEOUS! Her dress is a pretty ivory with tea-dyed lace on the bodice and luscious lace for the skirt. Her pretty look is finished off with a dusty pink flower headband and a sting of pearls - what more could a girly bear ask for! Thank you sooooooo much, Linda! Pearl was a lovely surprise gift and a welcome addition to the ever-growing Tag Along Teddies family! Tee! Hee! Hee! 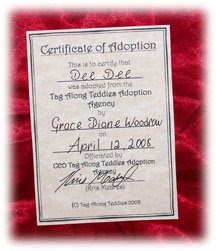 And speaking of expanding the Tag Along Teddies family ... there's been a new listing on the Adoption page of my web site. Her name is Dorothy. Of course, she is known to her friends at "Dotty"! Tee! Hee! Hee! And just like the magic shoes worn by that 'other' Dorothy in "The Wizard of Oz", Dorothy is made from a gorgeous deep, ruby red fabric that has been sprinkled with dainty white dots. Like her movie namesake, this little Dorothy looked like she was ready for an adventure, and what better adventure for a girl to have than a SHOPPING expedition. So ... Dorothy is dressed in her finest lace collar and pearl brooch and has a jaunty flower behind her ear and her trusty pretty-but-practical handbag ready to stash her new treasures - although, the boxes at her feet look like she's already had a head start! A bear after my own heart! Tee! Hee! Hee! 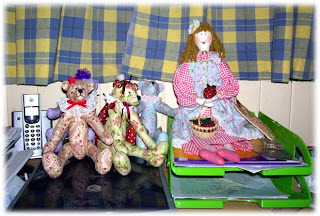 Like the other shabby chic bears, Dorothy has volunteered to be adopted out to a loving home to spread teddy love and bear hugs, so visit her and her sisters on the Adoption page of my web site. And speaking of adventures ... I don't have time for any today, because I just heard my washing machine go "BEEP!" to tell me I have to hang out the clothes, so ... "Hi ho, hi ho, it's off to work I go ..." Tee! Hee! Hee! Whether you're enjoying adventures or slogging away at home, have a BEARY good day!! Til next time, Bear Hugs! Doesn't it look great with some of Kerryanne's faux cupcakes from Shabby Art Boutique? 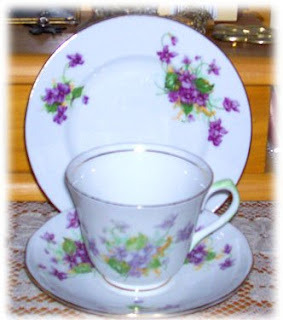 And I added to my growing collection of china decorated with violets with another trio. There's just something about the combination of the deep purple with dark green on a white china background that catches my eye every time! There was also a wonderful old wicker sewing basket that I coveted, but it was out of my budget, so, with a resigned sigh, I left it there. Linda and I then played "Marco Polo" on mobile phones to find each other in the crowd so we could adjourn to Laurel Bank Park for a civilised cup of tea and a sit down! Laurel Bank Park was set up in memory of a local woman who was vision impaired but loved gardens, so it is full of all sorts of scented plants. Some were lovely, like the lemon thyme and rosemary, but others were a bit 'on the nose' or as Linda described them, "smelt like cat's pee"! Tee! Hee! Hee! We also met some more of Linda's friends - whose names I've forgotten!!! Oh no! Sorry Linda's friends!! I remember faces really well, but am hopeless with names! I sometimes think I'm doing well if I remember MY name and there are DEFINITELY days where I think I need a name tag that says "My name is KRIS. If lost please return to..." ! Tee! Hee! Hee! After thus fortifying ourselves, we all ventured a little north to Highfields to enjoy the wonderful shopping/browsing/husbands' seat in the shade!! of the Village Green complex. It was great fun sharing some of my favourite shopping spots with Linda and nice for Scott and Tim to have someone to sit patiently in the shade with and chat!! They were both VERY patient men!! Linda found some lovely fabrics at Quilters Angel, before we called it a day and joined our menfolk in the shade for a delicious snack and cool drinks. A nice way to end the afternoon! We then went our separate ways for a few hours before meeting up to attend a bush dance held at our local church hall - where the kids had a ball!!! Somehow, the kids had Tim and Scott dancing to most of the dances, even if it was on the sidelines so they didn't get lost in the crowd, which led to me taking this photo of Scott as he was recovering from one of the more strenuous dances and deciding he really wasn't as fit as he used to be!! I still think he's pretty cute!! Sunday saw Linda, Tim and the kids head off in search of several different market days in the region, while Geek Boy retreated to play with his computer (I'm not playing, I'm working!! Aaa-huh, we believe you, Sweetie!!) and I finished off a wall hanging that's been ALMOST finished for some time. You may have to click on the photo and enlarge it to get a better view of the actual stitchery design, which is a dove with an olive branch in his beak - it was a bit challenging to get the light/colours right to show off the fabulous fuchsia as well as show up the dove stitched in grey/brown. It may seem a bit familiar to some of you, as I showed off the cushion with this stitchery design and the same eye-catching fabrics a little while ago. 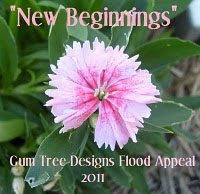 This is number two item for what will be a trio of projects for a new pattern I'm donating to Fresh Hope Patterns. Miss Mary has been very patient with an easily-sidetracked designer! The stitchery for the third project of this pattern has been completed, I just have to finish making it up then write the instructions! Oh no! Not MORE instruction writing!!! 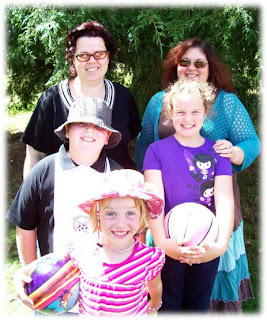 Then, this morning dawned sunny and warm, which was perfect for a farewell picnic morning tea with Linda, Tim and the kids in another of Toowoomba's numerous parks. Tim isn't in the photo as we had to have SOMEONE to take it and the only other one around was a kelpie dog, who didn't really look like a reliable photographer!! So ... all in all, I enjoyed a wonderful, relaxed weekend. And it was nice to discover a 'couple' that Scott and I could enjoy spending time with as a 'couple'. You know how sometimes you get on well with someone but your hubby and her hubby have nothing in common? 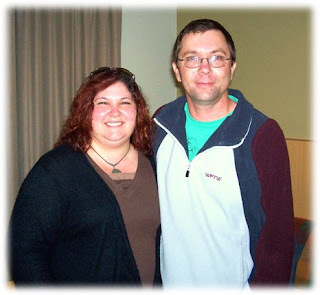 Well, Linda and I have been discovering for some time through blogging, emailing and my recent visit to her and Laura's wonderful shop, that we were like two peas in a pod, so it was nice to discover that Scott and Tim got along well, too. It made for a VERY enjoyable time all round!! Hmmmm, wonder when we can entice them back up the range for another visit! Tee! Hee! Hee! Now it's back to reality ... I've just remembered that I need to pop a load of washing in or my beloved Geek Boy won't have a clean shirt for work tomorrow - oops! And then there's the decision of what to have for dinner and the ever-growing list of "things to do" ... SIGH!! The weekend respite was nice while it lasted! Hope you had a great weekend and are now ready to face the new week. Til next time, Bear Hugs! Isn't she 'Dee-lightful'!! Tee! Hee! Hee! We should all be able to use bad puns from time to time!! You may recognise the pretty dusty pink floral fabric that Dee Dee is made from - it's one of the two pieces I showed earlier in the week that I found at Quilters Angel on the way home from our 'husband brownie-points building' weekend. 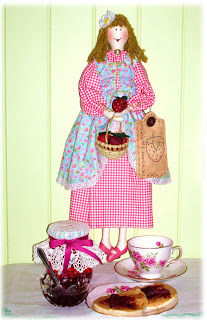 Mary will be popping in tomorrow to have a cuppa and whisk this dainty little dancer away. Sigh! I feel like a mother who's chicks are flying the nest - although, I think teddy bears are MUCH easier to cope with than children! Tee! Hee! Hee! And for those of you eagle-eye, would-be-detectives out there who've noticed the date on the adoption certificate isn't today's date, that's because Saturday is Gracie's birthday, so, Saturday's date goes on the certificate. I wasn't just having a 'moment' - although that happens frequently!!! And, sad to say, that's about all I've really achieved this week (although I DID vacuum the house today, so that should count!!). The reason? It's been overcast and VERY cool here in Toowoomba most of this week - perfect weather for ... curling up with a book - or two, or three, or ....!!! Yes, I'm an addicted bookworm!! Hello, my name is Kris and I'm a bibliophile! Ooooh! That doesn't sound good, but I'm assured this just means "book lover". 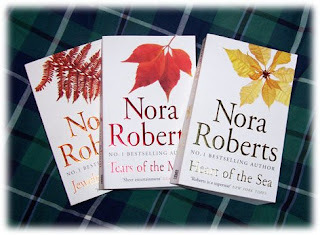 I've had my nose in a trilogy by one of my fave authors, Nora Roberts. This is the Irish Trilogy. Oddly enough, it's called that because the stories are set in Ireland!! They are all stand-alone stories, each about one of three siblings, but all link into a bigger story about star-crossed lovers. They're romance stories with a little faerie magic thrown in - how could you have stories set in Ireland that DIDN'T have a bit of faerie magic sprinkled through them! If you're looking for a good read with some humour, quirky characters, romance and faerie magic, make sure you check these books out! I really enjoy Nora Roberts' writing style and have lots of her books that I frequently re-read (much to my mother's bemusement, as she reads a book once and that's it!!) - some people have 'comfort food', I have 'comfort books'. They have LOTS fewer calories! Tee! Hee! Hee! And now I'm off to enjoy a dinner that's been cooked for me by my beloved Geek Boy - nothing fancy, but I didn't have to make it, so it will be a banquet! Tee! Hee! Hee! Oh! Almost forgot! I've got a special friend coming to town to play this weekend ... but I'm not going to tell you who it is yet ... I'll keep you in suspense and report back! Tee! Hee! Hee! Have a good night and enjoy curling up in the cooler weather. Til next time, Bear Hugs! That sums up my weekend! I told you all last post that my beloved Geek Boy had organised a surprise for Saturday afternoon. 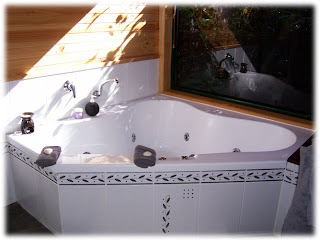 Well, it turned out to be a weekend deal and he whisked me away for a romantic interlude at Ravensbourne Forest Chalets! What a wonderful surprise! 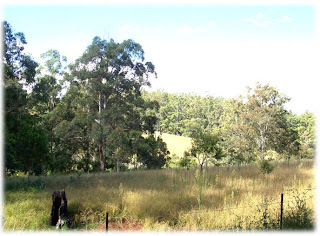 Ravensbourne is about 30 minutes drive north of Toowoomba and the country is lots of rolling green hills with pockets of cold-climate forest and it is soooooo pretty! So ... a warning now ... there are going to be LOTS of photos!!! You've been warned! Tee! Hee! Hee! After driving in on a gravel road that wound through magnificent tall trees, we were greeted by Wes Elphick and he loaded us up with our pre-booked dinner and breakfast hampers (Geek Boy was pulling out all the stops!!) 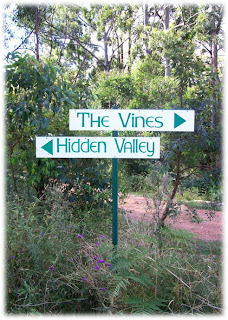 and pointed us towards our cabin - the Vines. A bit further down the track we found our little corner of paradise. 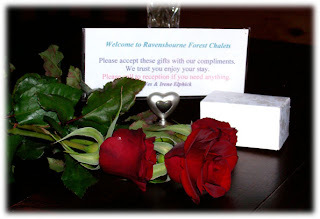 And were greeted with a lovely welcome pressie of three fabulous deep red roses (my fave rose colour!! ), a cute little gift box with some chocolates and a note from our hosts Wes and Irene welcoming us to their little slice of paradise! Could it get much better than this? ... YEP!! How appropriate!! There's a bear in there!! Sorry, 'Playschool' reference that only my Aussie visitors will recognise!! But wait, there's more! 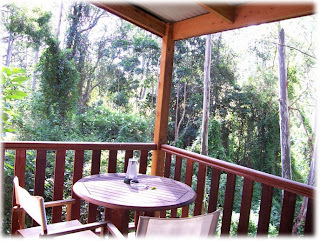 I discovered the deck, where I promptly curled up with a cup of tea and a book while Scott had a snooze. Though, I have to say I spent more time listening to the birds and admiring the view than I did reading. Want to see my view? Rolling green hills surrounded by pockets of forest! 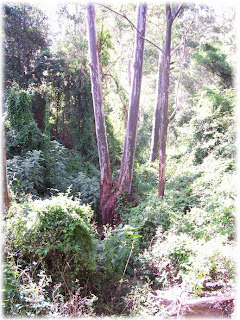 There were lots of lovely bird calls to listen to - magpies, bellbirds, whipbirds ... Sigh!!! Can it get better than THIS??? ... YEP!! It was just so lovely and rustic!! My beloved Geek Boy then proceeded to dazzle me with his culinary expertise and cooked our dinner - steak, chops, roast veges - YUM! After dinner, we curled up in front of the cozy fire, me with a book and (predictably!!) Geek Boy with his notebook computer. It was so peaceful - the television stayed off, we'd chat occasionally, we enjoyed the provided desert (golden syrup pudding and custard! 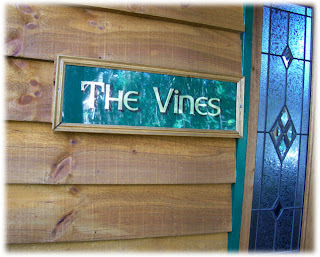 ), enjoyed a glass or two of wine ... very civilized indeed!! Morning brought more birdsong to greet us - as well as a cute little yellow and black bird who spent quite some time fighting with his reflection in the bathroom window!! You could hear his little birdie brain thinking, "Who does this intruder think he is, coming into my patch of forest! Mind you, he's awfully handsome!!" Tee Hee! Hee! Once more, Geek Boy donned his chef's hat and apron (metaphorically speaking, cos that would've just been too funny otherwise!!) and fired up the BBQ to cook bacon, eggs, fried tomato and toast. So, you can imagine that I felt like I was waddling after also having enjoyed a bowl of cereal and fruit, all included in our wonderful brekkie hamper!! Hmmm, must consider starting that diet again ... when we get home!! Tee! Hee! Hee! I then sat back with a cup of fresh coffee and listened to the wind in the trees and the bird calls while my beloved (voluntarily!!) did the dishes. 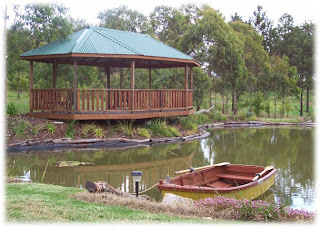 When at last we had to leave, we stopped into the office for a chat with Irene and said we would DEFINITELY be back again and would tell all our friends about their little corner of paradise and enjoyed a quick visit to the gazebo which is proving a popular spot for garden weddings. I can see why! Apparently, at night, you can hear lots of frogs tuning up for their choral practice, along with some nocturnal bird life. You can see why it was hard to drag ourselves away and back to reality!! I actually went hunting for pink fabric on purpose with the intention of making some more shabby chic teddy bears, but have to admit that the rose one on the right has really grown on me - oh no!!! I'm mellowing in my old age!!!! Tee! Hee! Hee! So ... that was my wonderful surprise for the weekend. Needless to say, Scott has earned himself some SERIOUS husband brownie points!! 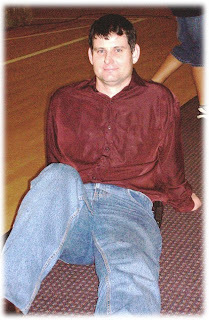 In fact, I was so impressed, I ironed him some work shirts for the week! Now, to some that would not seem out of the ordinary, but in the Meares' Madhouse, if you want to wear something that requires ironing, you'd better know how to work the iron, because it's one of my least favourite chores - most of my clothes are non-iron!! So, for me to iron more than one shirt for him, shows just how impressed I was with his efforts to organise a romantic get-away. 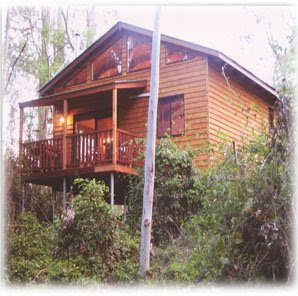 And if you're ever in Queensland and looking for a romantic, secluded hide-away, I get HIGHLY recommend Ravenbourne Forest Chalets! Just tell Wes and Irene that I sent you!! That way, I get lots of credit when you have a FABULOUS time! Tee! Hee! Hee! 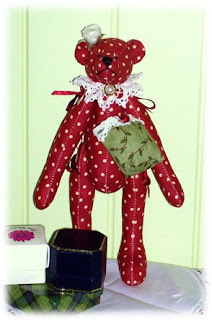 Now that I've made you all turn green with envy, I'm off to make a couple more pink bears. I know ... 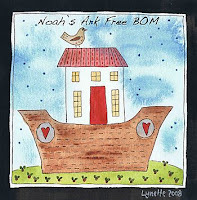 I should be writing the pattern instructions I put off on Friday to stitch Lynette Anderson's BOM block for April - but I'm in a lovely mood and don't want to spoil it! Tee! Hee! Hee! Wherever you are and whatever you're doing today, I hope there's a bird's song for you to enjoy! Til next time, Bear Hugs! It's a little hard to see the dove as it's stitched in ecru on a brown background, so I took another, slightly closer photo. 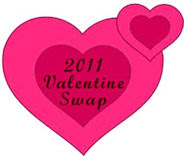 Hmm ... not sure that's much clearer (it looked clearer when I was playing with it in PhotoShop!! 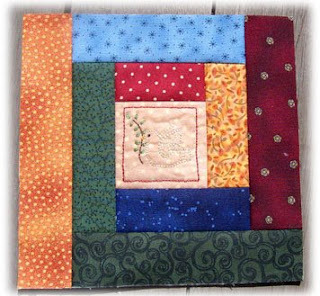 ), but if you want a better view of this cute dove, visit Lynette's blog and after you enjoy drooling over the photo of HER block, click on the BOM icon at the bottom of the left hand column of her main page and get stitching on your own - I expect LOTS of people to be telling me I helped get them hooked! Tee! Hee! Hee! 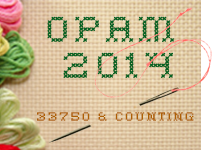 Isn't Lynette just so generous to be sharing her wonderful stitchery BOM with us!!! THANKS LYNETTE!!! Anyways, my beloved Geek Boy says he's taking me somewhere as a surprise this afternoon, so I'd best go get organised - will report back on our secret destination next post!! 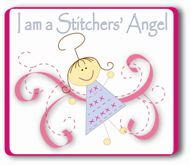 Have a fantastic weekend and don't forget to visit Lynette Anderson Designs!! 1. Write your own six (6) word memoir. 2. Post it on your blog with a visual illustration, if you like. 3. Link to the person who tagged you in your post and to the original post if possible, so we can track it as it travels through the blogosphere. 4. 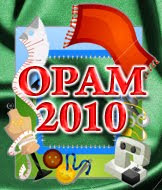 Tag 5 more blogs with links. "These three remain: Faith, Hope, Love." It's from one of my fave Bible passages, 1 Cor:13, the "Love" chapter, that is often read at weddings - and also funerals!! It goes on a little more and ends with, "but the greatest of these, is Love." I think I like it because it kind of encapsulates what life should be about. If these three things are built into your life's foundation, you've got a strong basis for everything else. And in a world where the nightly news seems to reflect nothing but negative emotions like rage and hate, it's comforting to think that these three things endure - and that despite all evidence to the contrary, the greatest of these is LOVE! OK, that's my little spiel. I'm not sure who to tag next, so will hold that in reserve for now. 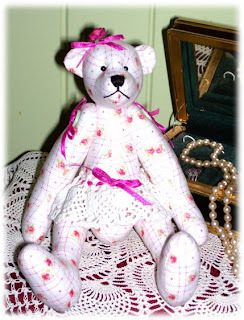 As well as tagging me this week, Linda also adopted one of my shabby chic "bearbies" - Belle. She hitched a lift with Australia Post (taking a Kit Kat with her as a snack for the long trip!) to arrive at Linda's home yesterday, where she promptly made herself at home amongst Linda's china collection. She will help Linda even up the boy:girl odds in her predominantly male household! Tee! Hee! Hee! It's nice to know my "bearbies" are going to loving homes! Oh! Before I sign off, the lovely Laura of Lilly Cottage has also posted her 7 weird/random factoids from where I tagged her - thanks for playing Laura!! Not only do you get to find out strange facts about Laura, you get to have a peek at a photo of her cute puppy and her gorgeous daughter! Anyways, I think it's time to head for bed - with a wheat pack! My shoulder is telling me I've spent too long at the computer and sewing machine this week and has tightened terribly on me today. I spent a lot of time looking like the hunchback of Notre Dame trying to balance the heated wheat pack on my shoulder to ease the cramping - "The Bells, the Bells!!!" Tee! Hee! Hee! Hope you have a great weekend, whatever you're doing and if you'd like to be tagged for the meme challenge, leave me a message and I'll tag you. Hmmm, maybe I could've done better at tag as a kid if I'd waited for people to TELL me they wanted to be tagged .... maybe not!!! Bear Hugs! Yes folks, contrary to the old saying, I believe you CAN teach old dogs new tricks! I came to this conclusion this morning when I very cleverly (I thought!) 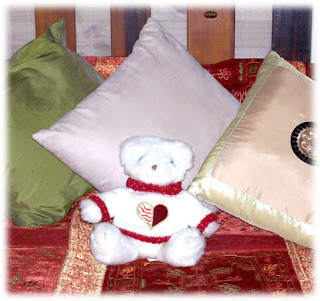 managed to add a new bear to the Tag Along Teddies Adoption Agency page of my web site - ALL BY MYSELF!!! Yay! My beloved Geek Boy would be proud - and just a litle relieved that there's at least SOME part of the web site that I can be responsible for! Tee! Hee! Hee! And what did I add, or more accurately 'who'? 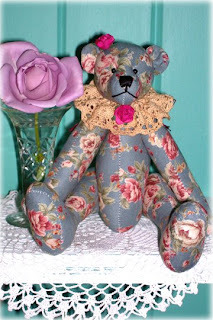 Another shabby chic bear called Belle. Take a look. She reminded me of the little music box dancer in a jewelry box - isn't she pretty! I do like the green/pink combo of colours. 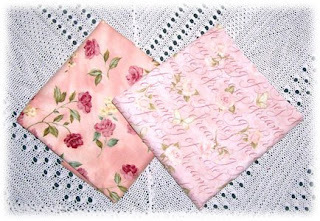 It's a little hard to see in the photo, but the fabric has a white background with very fine pink check lines through it with the little pink and green roses scattered in some of the squares. The lines of the pink check have a pretty sheen to them that caught my eye in the patchwork shop - even though I'm a confirmed 'non-pink' person! Belle is now waiting for someone to adopt her to a good home. Actually, the other 'new trick' I've finally got the hang of (after many explanations and tearing-out-hair sessions with Scott!!) 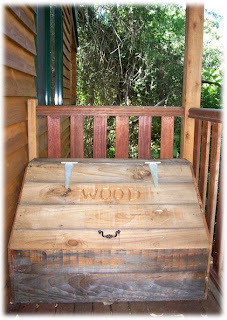 is inserting the links on my blog posts - YAY! Previously, I'd write my posts and get Geek Boy to come along behind me and insert the links, but I'm getting pretty practiced at it now! So far I haven't managed to send anyone off to a site that features very different 'teddies' to the ones I make! Tee! Hee! Hee! And speaking of 'dogs' and 'tricks' ... I said in my last post that our newly adopted dog, Lilly was supposed to be 'my dog' - according to Scott. Well ... does this look like 'my dog' to you??? I don't THINK so!! 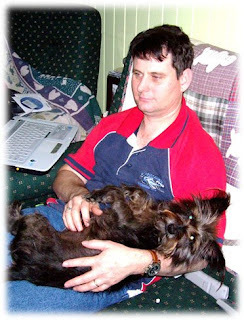 It turns out, that in her previous home, Lilly was home alone most of the day while her owners both went to work, but when they were home, it was Scott's workmate, not his wife, who Lilly spent time with. Apparently, after dinner, she would be encouraged to do a trick for a doggy treat and would then curl up on his lap to snooze while he watched TV. So ... guess who she waits to spend time with here?? SIGH! I can handle rejection - I think I'll get myself a budgie to chat to!!! Tee! Hee! Hee! Anyways, I'm off to eat worms - you know that old song, "Nobody loves me, everybody hates me, I think I'll go eat some worms..." Tee! Hee! Hee! Hope you're having a worm-free day! Til next time, Bear Hugs! It's been a day of adoptions - well, actually, YESTERDAY was a day of adoptions, I'm just a day behind because of it! Oops! Story of my life! The first adoption was perhaps the biggest, as we agreed to become adoptive parents of a very active two year old. Her name is Lilly. She is a Silky/Foxy cross - apparently!! Scott says she's got an "RSPCA advertisement face". Hmmm, not sure that's the sort of compliment a girl wants to hear! One of Scott's workmates is moving to Brisbane and as he and his wife are renting a house rather than buying, they found it impossible to find a dog-friendly rental property, so needed to find Lilly a new home. We had "SUCKER!" written on our foreheads ... No! No! No! I mean ... we are known to be animal lovers!! Yes, that sounds better! Tee! Hee! Hee! So, Lilly has come to live with us. I dare say there will be some adjustments to be made by all involved, particularly as both Lilly and Wombat - our 'other' furry child - have both been 'only children' up until now. So far, though, Wombat's not complaining too loudly, as we spent quite a lot of time in the yard this afternoon helping Lilly get acquainted with her new home, so Wombat got a REALLY good game of Frisbee. Here he is waiting eagerly for the next throw! I'll no doubt keep you up-to-date with our future furry foibles! 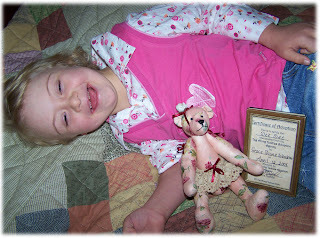 Now the second adoption went the other way - one of my 'bearbies' was adopted out. 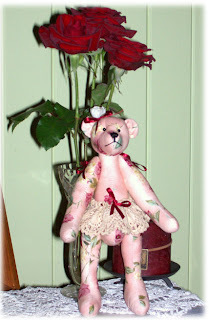 Rose is one of the shabby chic bears I've been stitching and have added to an Adoption page on my web site. For a friend of mine, Deb from Newcastle, it was love at first sight, so Rose will soon be hitching a lift with Australia Post to move to Newcastle. Here she is. The rose in the photo is one from my garden. My roses don't seem to get enough sun, so the blooms are few and far between, but I do love their vivid colours and perfume. 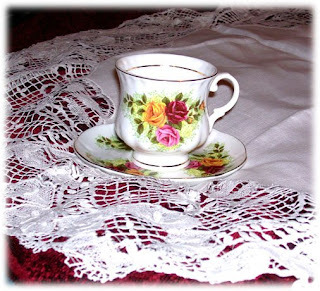 And it was Rose's vividly coloured fabric that earned her her name, since it features old-fashioned roses! She's looking forward to meeting Deb and giving her lots of bear hugs. There are still some of Rose's sisters up for adoption on my web site if anyone is looking for a new family member. Well, that's really all that's been happening in the Meares' Madhouse for the last couple of days ... OOOOOHHHH! Before I forget (again!) 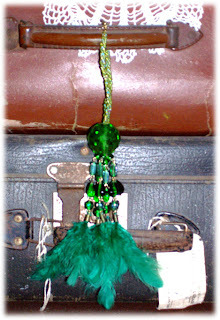 if you want a REALLY good laugh, head to Kerryanne's blog at Shabby Art Boutique and read about her recent holiday adventure, involving a washing machine and a bottle of laundry liquid - you've probably already got a clue about the gist of it, but you REALLY must read it, because Kerryanne is a wonderful storyteller!!! I told her that the reason I found it so funny (laughing out loud, tears rolling down my face, funny!!) was that it's usually ME that these things happen to, so I could completely identify with her dilemma! So ... having come to the end of today's news update (sound like the evening news broadcast, don't I?! Tee! Hee! Hee!) I shall go and see what the furry children are up to. Til next time, Bear Hugs! PS. 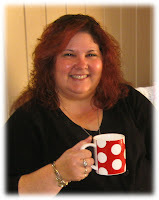 Forgot to tell you all - Gail Pan of Gail Pan Designs (she designs and makes GORGEOUS creations!!) responded to me tagging her and has listed her 7 strange/weird/unusual factoids on her blog, so pop over to say G'day and have a read!